﻿ 5 Corporations Now Dominate Our Privatized Intelligence Industry | "Global Possibilities"
This is incredibly risky for a country so dependent on intelligence to fight global wars and prevent domestic attacks. Yes, that’s 80 percent. For the first time since spy agencies began outsourcing their core analytic and operational work in the late 1990s, the bulk of the contracted work goes to a handful of companies: Leidos, Booz Allen Hamilton, CSRA, SAIC, and CACI International. This concentration of “pure plays”—a Wall Street term for companies that makes one product for a single market—marks a fundamental shift in an industry that was once a highly diverse mix of large military contractors, small and medium technology companies, and tiny “Beltway Bandits” surrounding Washington, D.C.
As I argue below, these developments are incredibly risky for a country more dependent than ever on intelligence to fight global wars and prevent domestic attacks. “The problem with just five companies providing the lion’s share of contractors is that the client, the U.S. government, won’t have much alternative when a company screws up,” says David Isenberg, the author of Shadow Force: Private Security Contractors in Iraq. Moreover, the fact that much of this privatized work is top secret—and is generally underreported in the press—undermines the accountability and transparency of our spy agencies. That should deeply concern the American public. The fact that much of this privatized work is top secret undermines the accountability and transparency of spy agencies. Fortunately, there is plenty of public information to build a profile of these companies. I’ll start this analysis with a closer look at the members of the new monopoly and a detailed explanation of how I reached my conclusions about their workforce. CSRA Inc. was created out of a merger between CSC, which developed and manages the NSA’s classified internal-communications system, and SRA International, a highly profitable company with a long history of involvement in intelligence, surveillance, and reconnaissance (ISR). Among scores of other contracts, CSRA, which has close ties to the US Air Force, provides 24/7 support for the “global operations” of US commands in Europe and Africa and, under a January 2016 contract, manages the “global network of intelligence platforms” for the most advanced drones in the US arsenal. And in a bizarre set of contracts with the Pentagon’s prison in Guantánamo, it was hired to help both the defense and the prosecution in the military trials of individuals accused of planning the 9/11 attacks. SAIC is a well-known military contractor that has expanded into spying by buying Scitor, a company deeply embedded in the Pentagon’s top-secret satellite operations. Scitor’s real value for SAIC is its reach into the National Reconnaissance Office (NRO), which manages those satellites and integrates downloaded signals and imagery from space for the NSA and the National Geospatial-Intelligence Agency (NGA). SAIC’s latest project: an $8.5 million contract from the Army’s Intelligence and Security Command for “aerial ISR” in Afghanistan to be partly carried out at the NSA’s huge listening post in Fort Gordon, Georgia. CACI International is the Pentagon contractor infamous for supplying interrogators to the US military prison at Abu Ghraib in Iraq. CACI recently acquired two companies doing extensive work for the NSA and the CIA: National Security Solutions (bought from L-3 Communications) and Six3 Intelligence Solutions. Both have given CACI new inroads into national intelligence. Six3, for example, recently won substantial contracts to provide “counterinsurgency targeting” to NATO forces in Afghanistan. It also just won a new Army contract to provide intelligence to US military forces in Syria—an indication of how deeply US forces are now engaged there. It’s also the only contractor I know that quantifies its results: CACI’s intelligence services have “identified more than 1,500 terrorists threatening our nation,” it claims. Together, Leidos and its four competitors earned nearly $16 billion from government IT contracts in 2015, according to an annual listing by the trade publication Washington Technology. But the key to their dominance lies not with their revenue but with their employees—specifically, their approximately 45,000 contractors with security clearances who work alongside government employees at the NSA, the CIA, and other agencies. Information on the size of this workforce is difficult to come by, in part because the government likes to keep it secret. But most contractors provide figures on their cleared workforce in annual reports, media briefings, and press releases on new acquisitions, largely to impress government clients and potential investors. Here’s what I found in my study. Before the merger, Leidos employed 9,400 people holding security clearances, according to figures on its website that were confirmed by a company spokesperson. They are now joined with about 2,000 cleared employees from Lockheed’s IT unit, for a total of 11,400 cleared professionals (in its story on the merger, The Washington Post said the total number was 13,000). I then took into account the company’s share of earnings from military, intelligence (27 percent of its revenue, according to Leidos), and civilian contracts, and concluded that the Leidos intelligence workforce now numbers about 8,000. The figures for its competitors, using the same calculations, are equally staggering. Booz Allen deploys an intelligence workforce of 12,000 cleared personnel; CACI, 10,000; CSRA, 8,000; and SAIC, 6,600. Added together, the five companies employ 44,600 cleared personnel, which I rounded out to 45,000. That’s nearly 80 percent of the total contractor workforce of 58,000 and about one-fifth of the total workforce of 183,000 civilians, contractors, and uniformed soldiers working in national and military intelligence. The aggregate workforce figures were derived from comparing the corporate statistics listed above to contractor data buried in US intelligence budgets. The number of contractors in intelligence was first revealed in 2013, when Edward Snowden leaked the details of a classified $52.6 billion budget for the National Intelligence Program (NIP) to the Post. That document showed the workforce at just over 107,000, while an accompanying graphic explained that some 20 percent of them—or 21,400—were contractors. That total was down by 3 percent from 2011, when Senator Dianne Feinstein, then the chair of the Senate Intelligence Committee, told Congress that contractors accounted for 23 percent of the NIP workforce (the national budget covers the CIA, the intelligence units of the Department of Homeland Security, and 14 other government agencies, as well as the parts of the NSA and NGA that report directly to the president). My second source for the IC’s employment figures is the budget for military intelligence programs (MIP), which funds operational and tactical programs carried out by the armed services and units of the NSA and the NGA that are under direct Pentagon command. The declassified, “top line” version of the 2016 MIP budget ($17.9 billion) was released in February by the Defense Department, but it did not include any personnel numbers. However, in congressional testimony in 2013, when $18.6 billion was allocated for the MIP, the Pentagon said it employed a total intelligence workforce of 183,000, including civilian and contractor employees, plus uniformed military. The Pentagon doesn’t break out contractor figures, however (such details “remain classified for national security reasons,” the DoD explains). So, to find those figures, I applied the same 20 percent breakdown found in Snowden’s leaked national intelligence document. That would mean a military intelligence contractor workforce of 36,600—a reasonable estimate that’s probably too low, I was told by several experts. For the grand total, I added the national and military programs together, and came up with my conclusion that 58,000 contractors work in US intelligence. As you can see, by employing 45,000 of them, the five dominant “pure plays”—Leidos, Booz Allen, CSRA, SAIC, and CACI—control a huge chunk of the total. These five, of course, are not the only players in this market. The spies-for-hire workforce includes thousands of professionals from the still-formidable intelligence divisions of Northrop Grumman, Boeing, Raytheon, BAE, and Accenture, and a handful of smaller companies, including ManTech International Corporation, Engility Corporation, L-3 Communications, and PAE. A similar analysis of these firms, I believe, would show that they make up the rest of the intelligence force not employed by the Big Five. So here’s the bottom line: not only has intelligence been privatized to an unimaginable degree, but an unprecedented consolidation of corporate power inside US intelligence has left the country dangerously dependent on a handful of companies for its spying and surveillance needs. Intelligence privatization has been largely ignored by both the national media and Congress. To be sure, concentration by itself isn’t necessarily a bad thing. When a few companies dominate a single market, as in banking or the railroads, the result can be greater efficiencies all around, and sometimes even lower prices—if the industry is well-regulated. But if not, as we know from the collapse of Wall Street a few years ago, the downside can be pretty ugly: high-level corruption, taxpayer bailouts, and business failures that create destructive ripple effects throughout society. All of that and more has happened in intelligence contracting. In fact, being “too big to fail” is especially potent in intelligence, which has experienced numerous failures over the years. One of the most spectacular was the infamous Trailblazer project at NSA. It was designed by contractors in the spring of 2001 to “revolutionize” the NSA’s collection of signals intelligence from the Internet. SAIC won the prime contract to build it. But Trailblazer ended up a costly failure, wasting over $7 billion, according to whistleblower Tom Drake, who was a senior NSA executive from 2001 to 2008. In 2003, because Drake and others had blown the whistle on the project, Trailblazer was the subject of a highly critical Pentagon audit into corporate fraud. But the audit remains classified to this day. And the prime culprits, SAIC and Booz Allen (which helped design it), continue to win big contracts despite strong evidence that they wasted billions of taxpayer dollars and modified and suppressed internal studies about the project. Yet with few exceptions, intelligence privatization has been largely ignored by the national media and the publications established to expose what they call the “surveillance state.” And Congress, by ignoring this huge elephant in the room, is simply not doing its job. James Clapper, President Obama’s director of national intelligence, knows privatization from his own experience. From 1998 to 2001, he was the director of intelligence programs for SRA International, the predecessor to CSRA. Moreover, his own office is crawling with contractors. According to a declassified ODNI budget that was released under a Freedom of Information Act request last spring, contractors hold 44 percent of the positions in Clapper’s office, including 13 percent of his senior leadership. That total is twice as high as contractor penetration in the rest of the Intelligence Community, and further evidence of how much of our spying is done for profit. 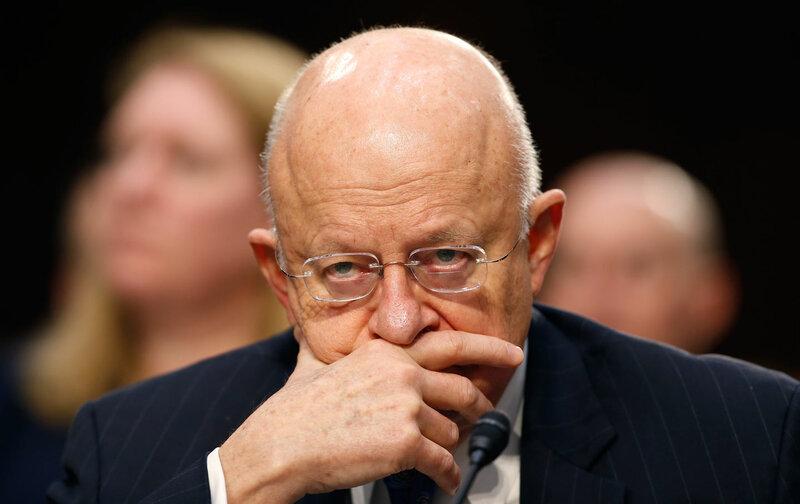 In public, Clapper makes no bones about those corporate ties. “If you can’t get a job in the IC, then sign on with one of our contractors,” he told an intelligence conference last fall. “Industry is absolutely crucial to our continued viability and success.” But if that’s true, why not let us know the names of all those companies? What’s at stake in intelligence outsourcing is not just the movement of money and goods, but also the security of the American public and control over the information that keeps us safe. Market concentration in this sector, therefore, has deeper and more sinister implications than in civilian industries such as finance or telecommunications. Concentration means that fewer and fewer companies control the information that guides our military and civilian leaders and, by extension, shapes America’s view of the world and the military and political actions it takes. The same logic should be applied to intelligence and the way our government and military receive their daily view of the world. It’s time for Congress and the media to finally recognize spying as a joint venture between the security state and the private sector. In the end, intelligence is a public resource that deserves to be controlled by the people and for the people, and not benefit a small group of corporations and the oligarchs they’ve spawned.